I am truly never disappointed with anything that Pepper Winters writes! My husband always knows when I'm reading a "Pepper book," because I'm always giddy when I receive it and enthralled and constantly sneaking away to read! Crown of Lies had a different take on characters from anything I've read before. We have a young, wealthy female that is a business prodigy from a young age, sheltered from the real world and its dangers, and a scrappy, homeless young man that she falls for, then immediately is torn away from, never learning his name. Fast forward three years and Elle finds herself trying to move on with a mysterious wealthy alpha male who wants a strictly physical relationship. But what happens when she tries to figure him out? When the mystery of who he is has her constantly questioning whether she should trust him or even continue to see him? She doesn't even like him, to be honest. The physical pull to him is undeniable. Who IS he? The tangled web of lies and secrets is intriguing and exciting. I was totally hooked! My mind is spinning with all the possibilities of the dynamics between Elle and her affair with a secretive man, her father, another man her age that she has known since childhood and the men that caused her such fear in the city on her night out as a teen. I'm very thankful the wait for book two is not a long one! I'm never quite sure what to expect when I start a book by Pepper they are all unique in their own way, one thing they never are is predictable. The author has weaved a mysterious enthralling story that I didn't want to put it down. I thought I knew what was happening, where the story was going to go but then the author throws a grenade into the story and I realised I knew nothing, nothing at all. You begin to analyse every word the characters say trying to find some hidden clue, because you aren't sure what is truth and what is a lie. Elle and Penn are fabulous characters they grab you and don't let go and have fallen yet again for another one of her male leads. A brilliant story that will keep you guessing from start to finish I'm counting the days till book 2. Crown of Lies is intense. Everything you think you know leaves you filled with doubt. Everything you previously thought could be true. And in the end? It isn't over. You want the truth? You aren't reading the right book. This book is filled with lies. Her lies. His lies. Everyone's lies. Which one will you cling to in the end? This review of Crown of Lies by Pepper Winters is for The Sweet Spot Sisterhood Blog. It is book #1 in the Truth and Lies Duet. I give it 5 Stars! I love Pepper Winters and I loved Crown of Lies. I cannot wait to read the follow-up, Throne of Truth. 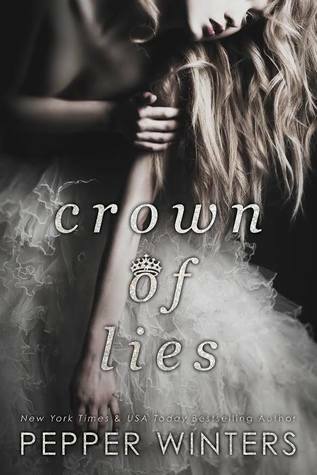 Crown of Lies isn't your typical romance. Winters has thrown in a few delicious twists and suspenseful turns. I literally could not put this book down. You never know what you are going to get with Pepper Winters. Her writing styles are so diverse. I believe that is why she appeals to so many. Crown of Lies is the story of Noelle "Elle" Charlston, heir to Belle Elle company. She has money and power. She has helped her dad run the company since she was 12. However, on her 19th birthday, she wants to venture out into the city on her own for once. Big mistake! Big! Huge! She is robbed and nearly raped by two young punks. Then a third one arrives and comes to her rescue. She spends the rest of the evening with this man but never learns his name and they are separated by the authorities in Central Park. Elle refers to him as Nameless and is never able to locate him. Fast forward a few years and Elle has two love prospects, Greg, the son of her dad's friend who also works for Belle Elle and Penn Everette, a man of mystery. Although Greg seems to be the likely candidate since he and Elle were raised together, Penn won't back down. Crown of Lies leaves us hanging........ but not for long because Throne of Truth is due out later this month! Trust me, you do not want to pass this duet up.